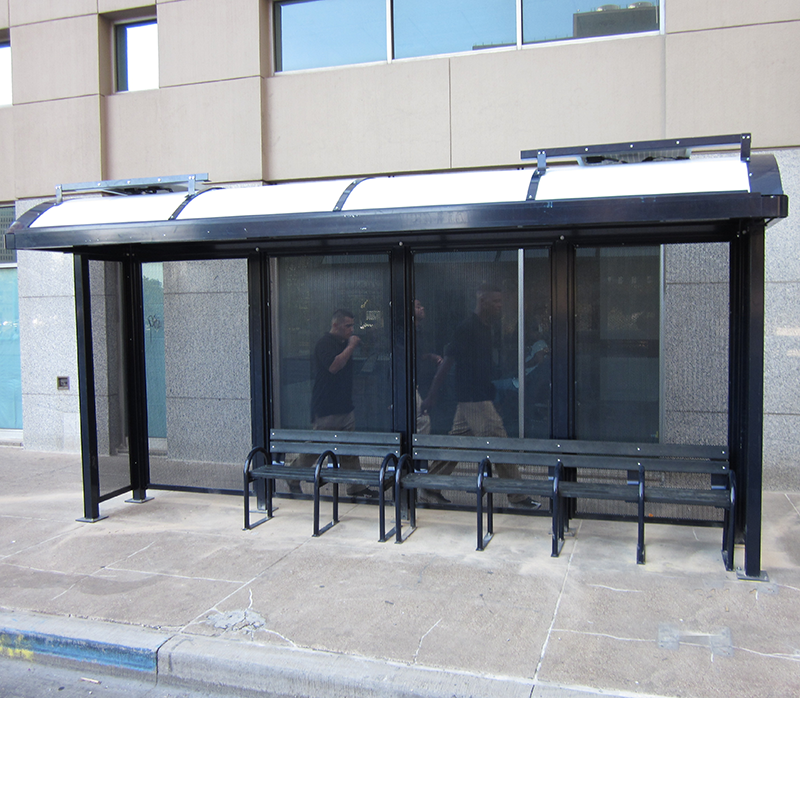 The perfect fit with minimal parts and easy installation. 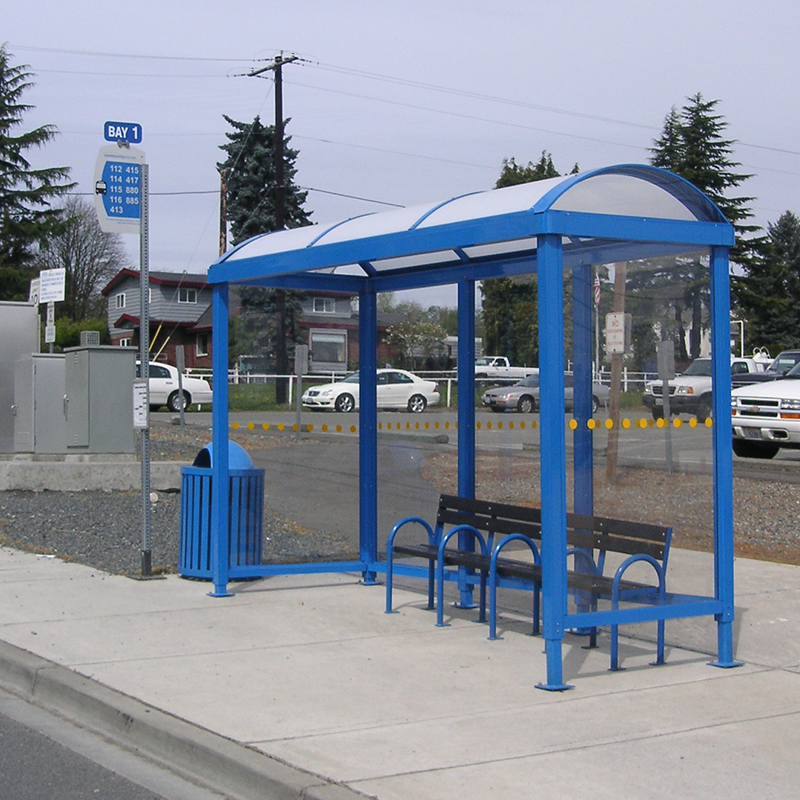 Our Niagara Transit Series shelter offers light, ventilation, simplicity, and visibility. 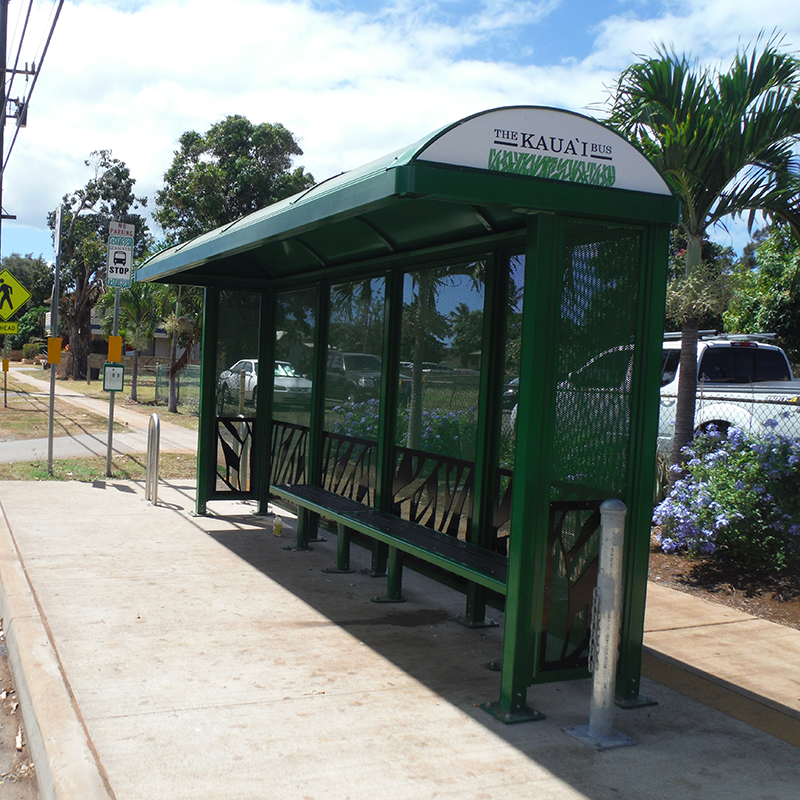 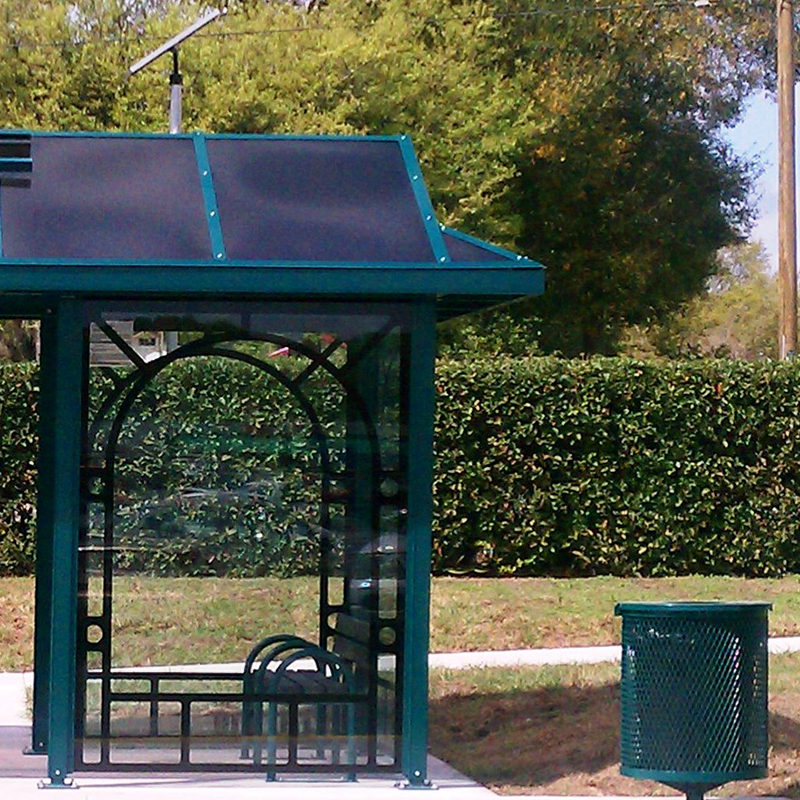 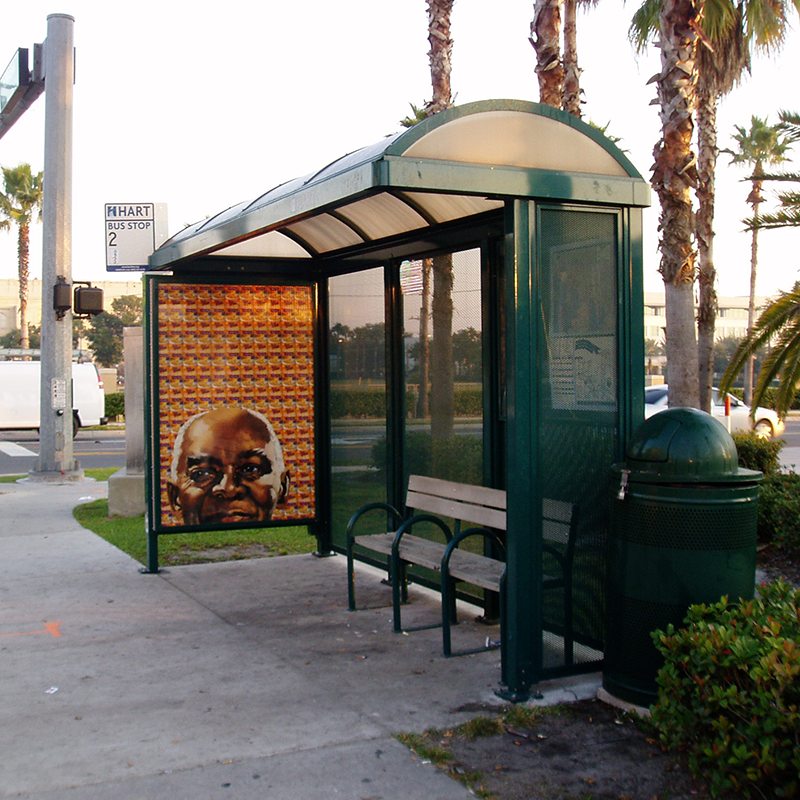 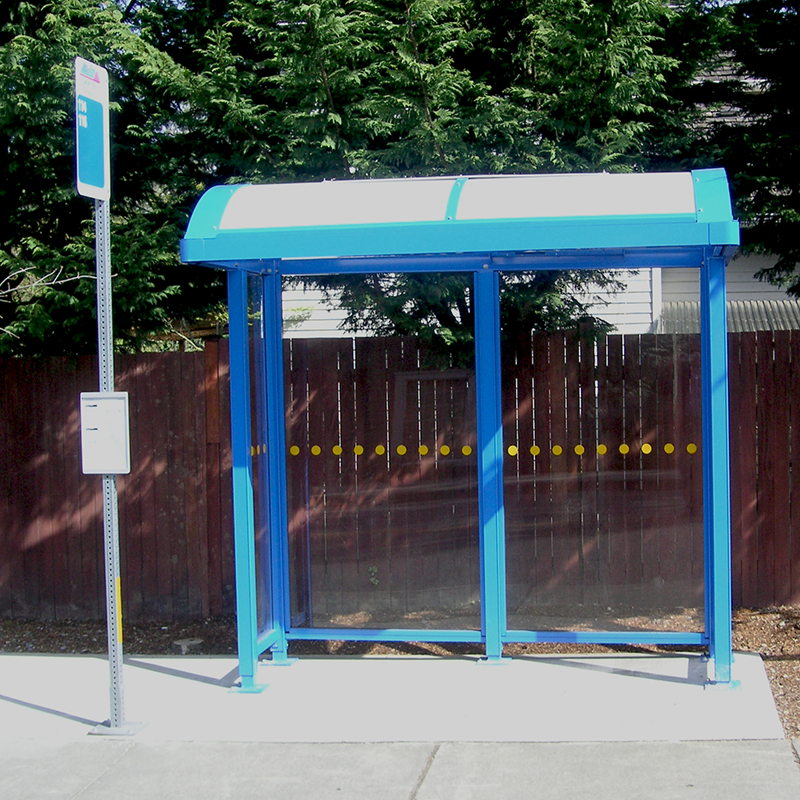 The clean, open appearance, bus shelter design flexibility, ease of maintenance and simple installation make this a favorite for transit shelter buyers nationwide. 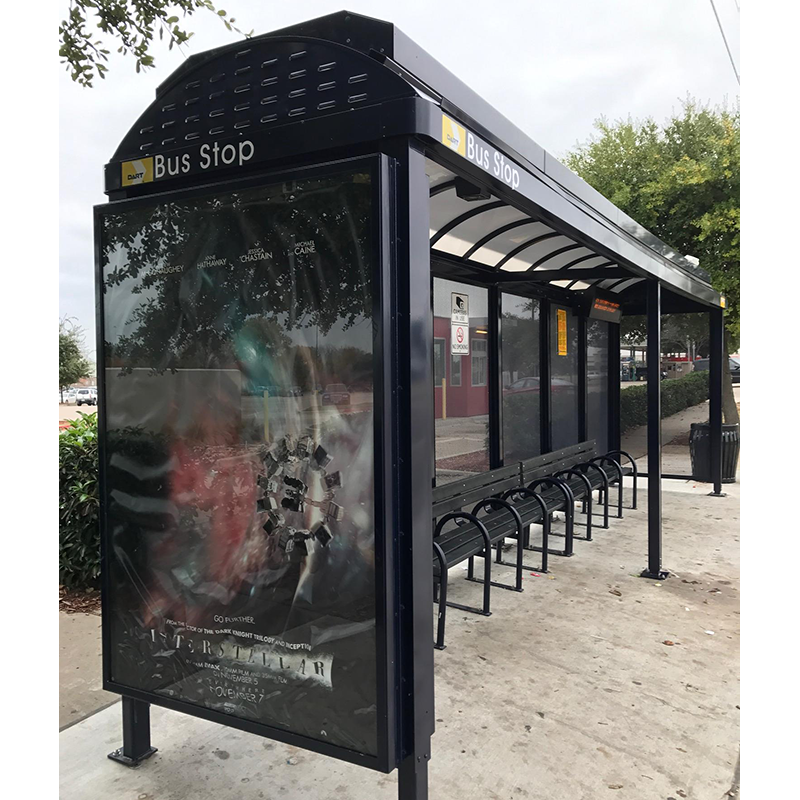 As with all of Tolar Manufacturing’s bus stop shelters, street furniture, solar solutions and outdoor digital/static advertising displays, the Niagara Transit Series offers a wide range of size, design and style options. 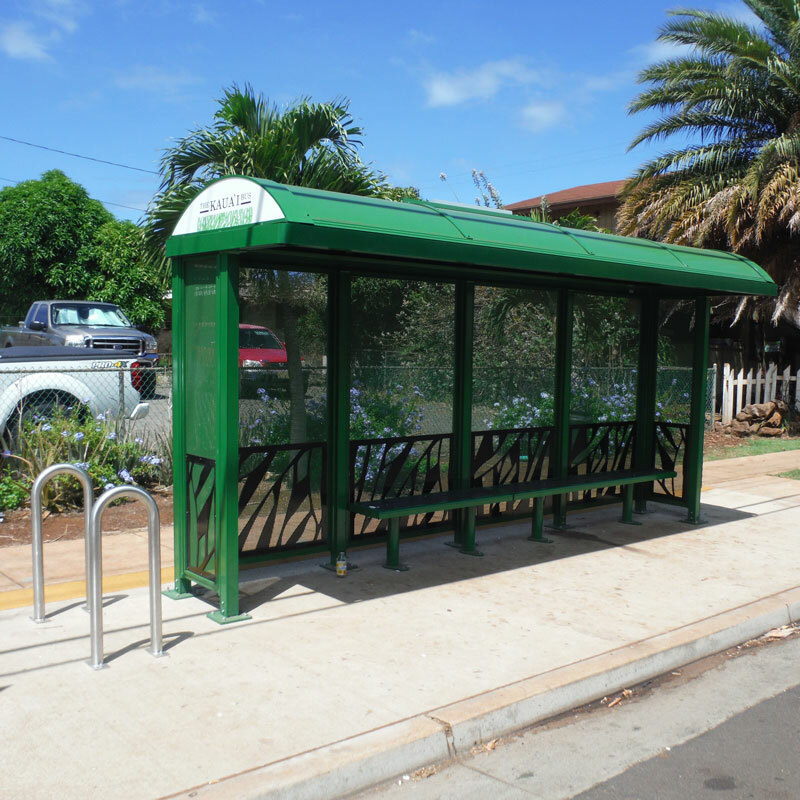 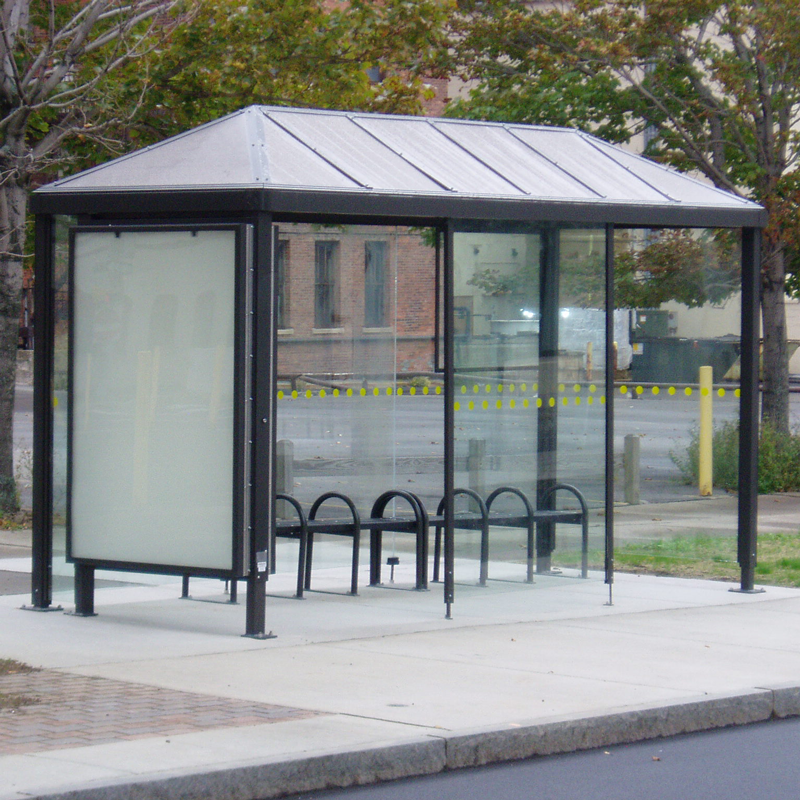 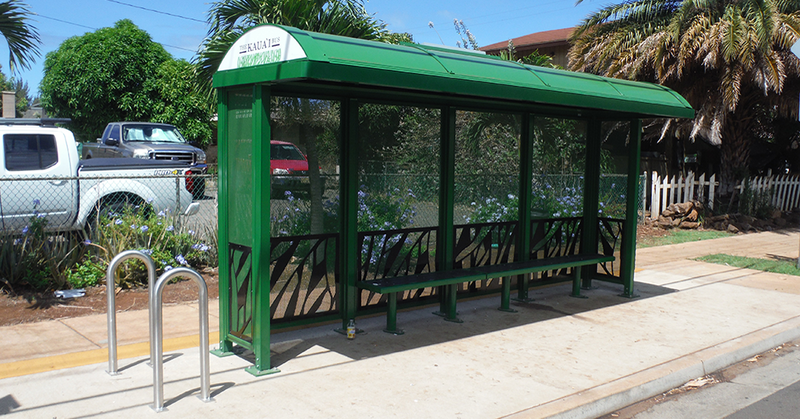 Our team of engineers, designers and fabricators will exceed your expectations ensuring all bus shelter design specifications are met from initial design to custom manufacturing. 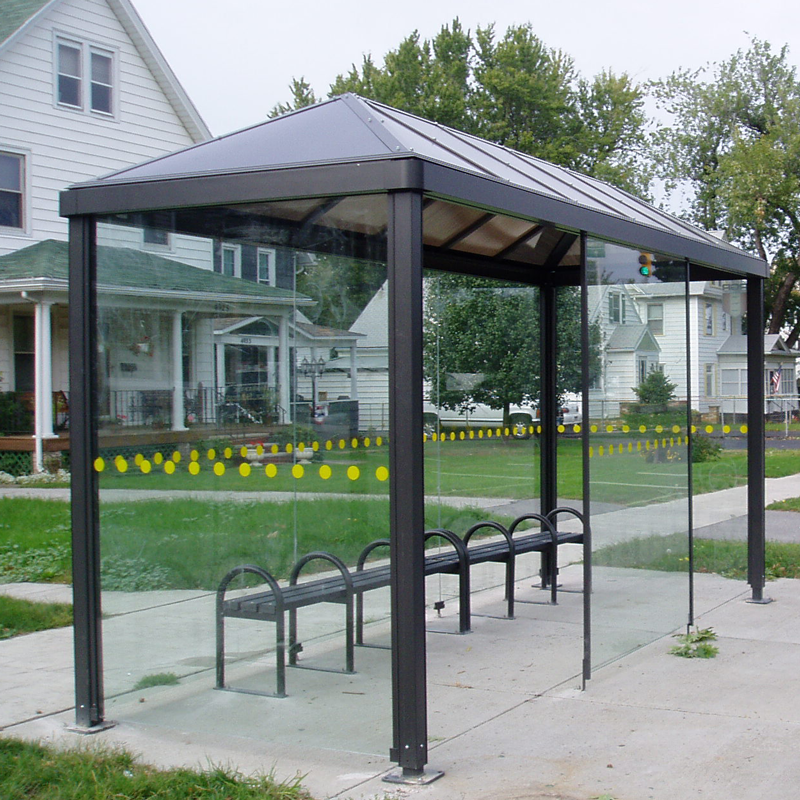 16′ Niagara non-ad palladium roof transit shelter with bronze Lexan roof panels, 3/8″ framed glass walls, integrated map case, recycle slat bench with back and anti-vagrant loop arms-solar lighting. 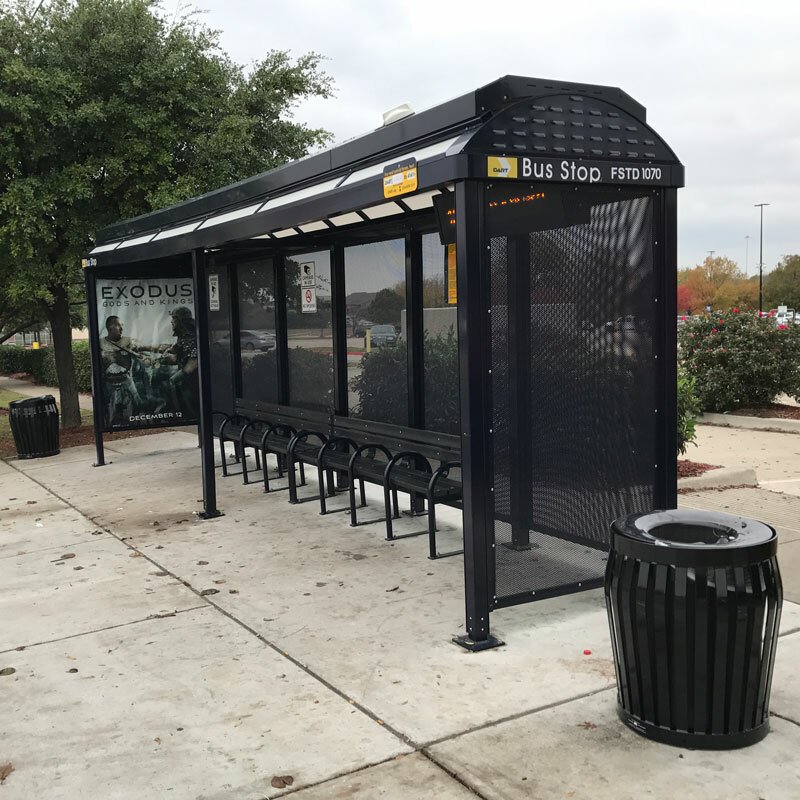 16′ Niagara dome roof transit shelter with white monolithic roof panels, vent ends, perforated metal panels at the rear and full end walls, recycle slat benches-solar lighting. 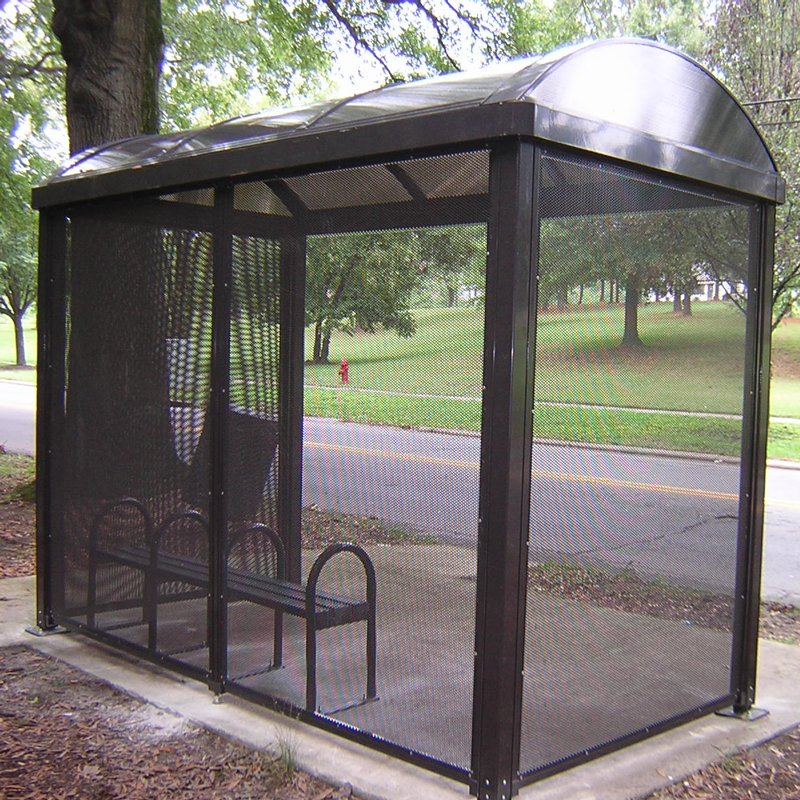 10′ Niagara dome roof transit shelter with bronze Lexan roof panels, perforated metal rear walls, recycle slat loop arm bench without back. 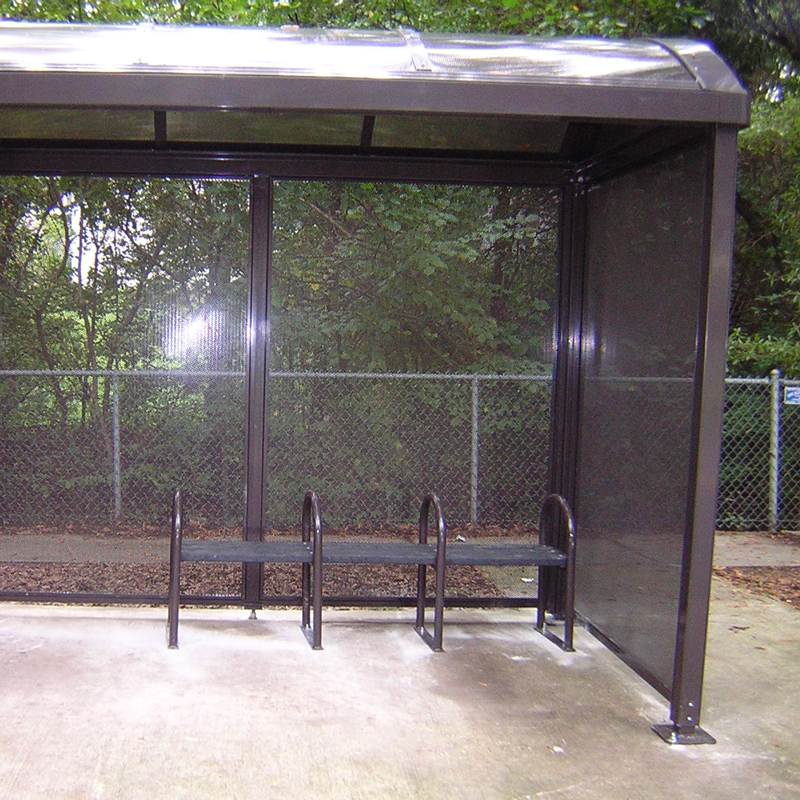 12′ Niagara dome roof transit shelter with white Lexan roof panels and Lexan rear and end walls-locker room style slat bench. 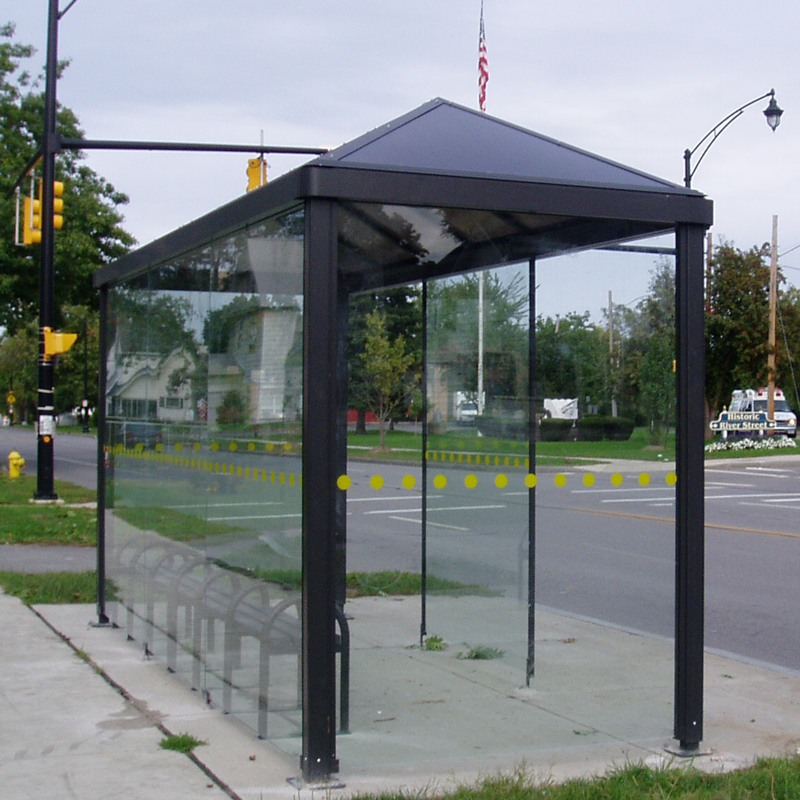 8′ Niagara dome roof transit shelter with white Lexan roof panels, rear and end walls. 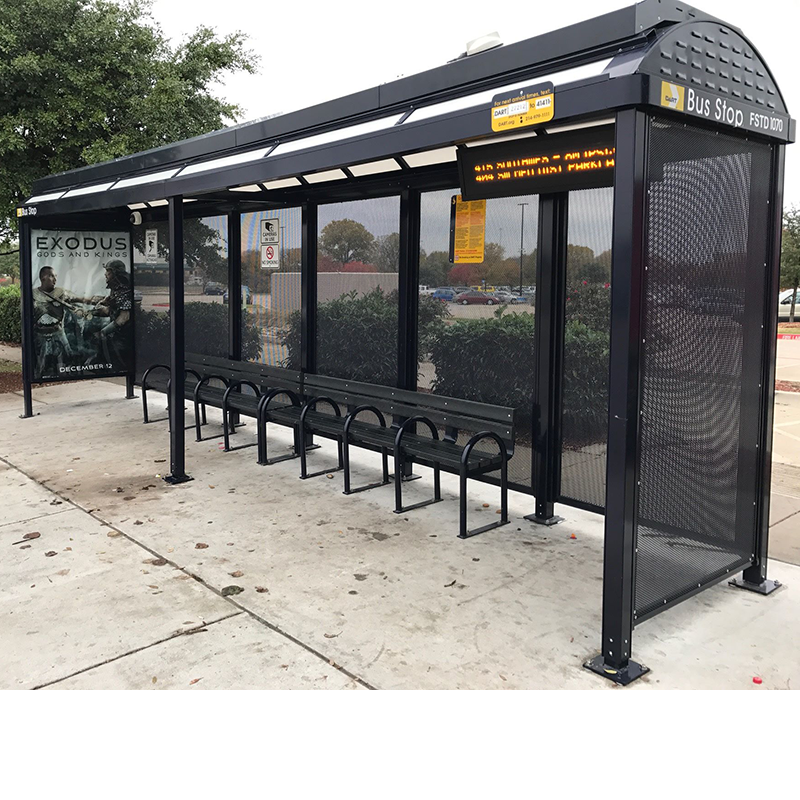 8′ Niagara dome roof transit shelter with white monolithic roof panels, vent ends, perforated metal panels at the rear and full end walls, recycle slat benches-solar lighting. 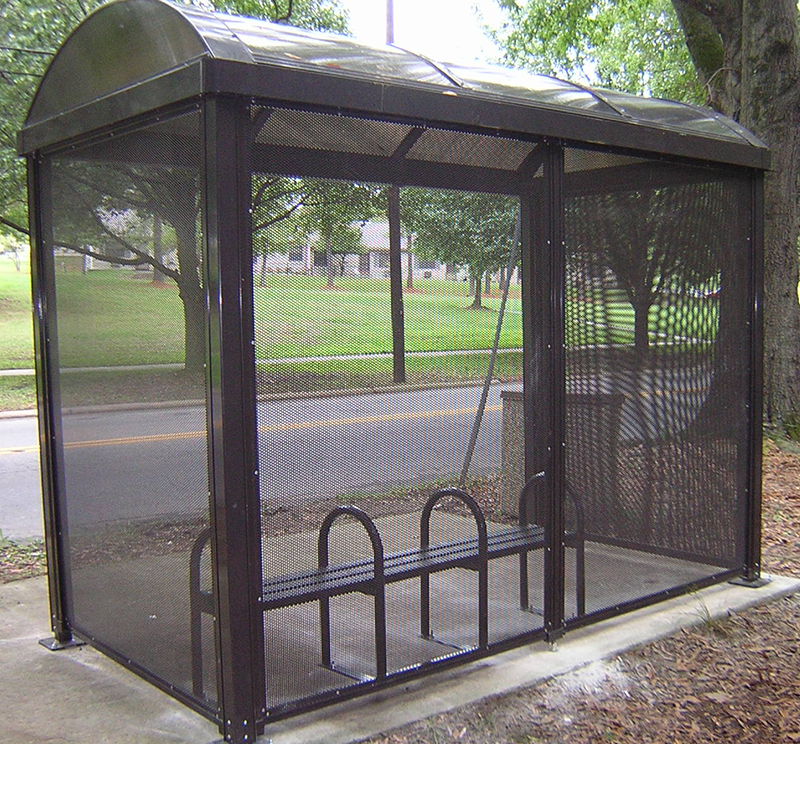 12′ Niagara dome roof transit shelter with bronze Lexan roof panels, 3/8″ Victorian frit style glass walls, integrated map case, recycle slat bench with back and anti-vagrant loop arms-solar lighting. 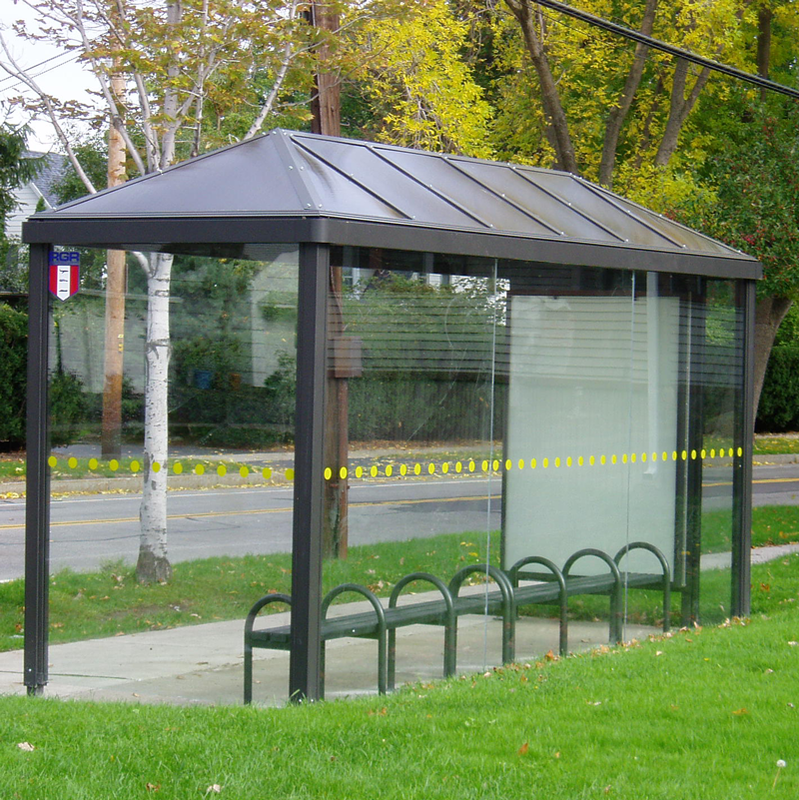 16′ Niagara hip roof transit shelter with bronze Lexan roof panels, 3/8″ clear glass walls, recycle slat benches with anti-vagrant loop arms. 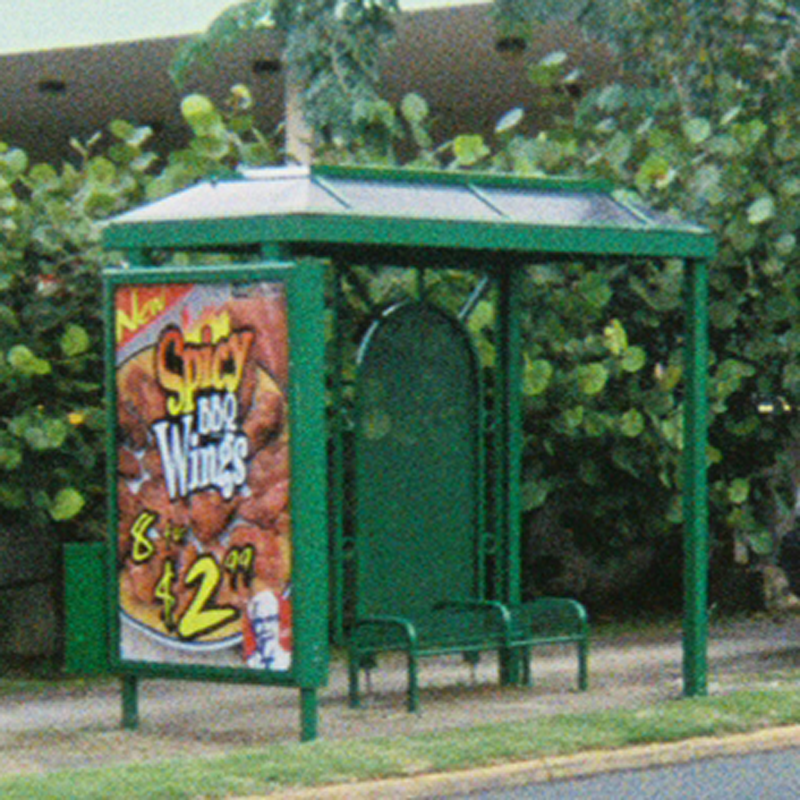 26’ Niagara enhanced bus advertising SmartPlace™ transit shelter with opaque monolithic roof panels, back-to-back LED illuminated advertising display kiosk, perforated metal walls, two line real time information sign, camera, slat benches with back—all components powered by 600watts of solar that allows for real-time monitoring, roof safety lighting, security camera and data communication. 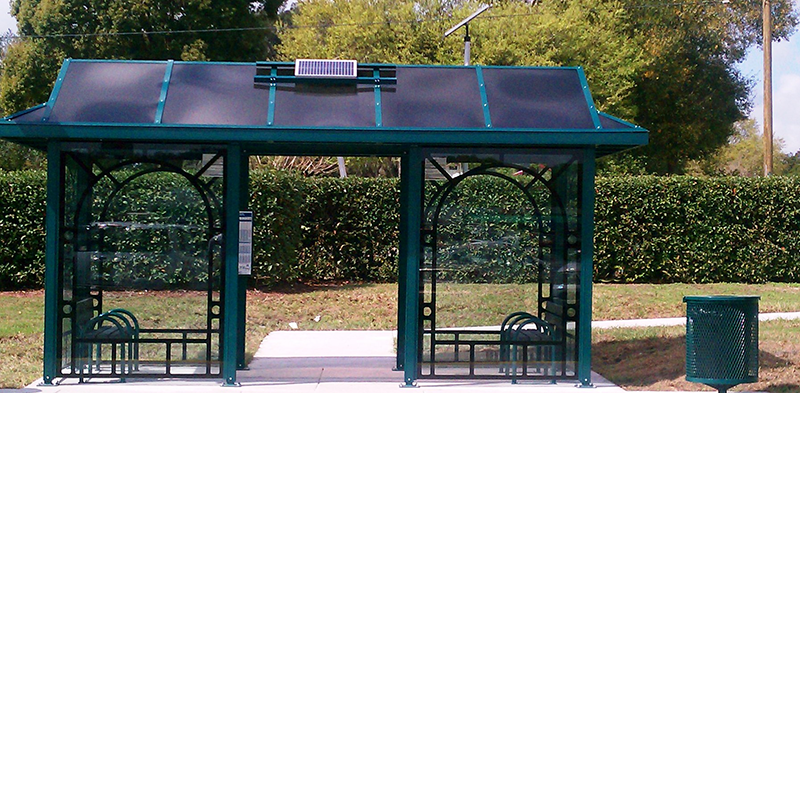 Solar is designed with an integrated roof fixture that houses the batteries, energy management system (EMS) and data communications. 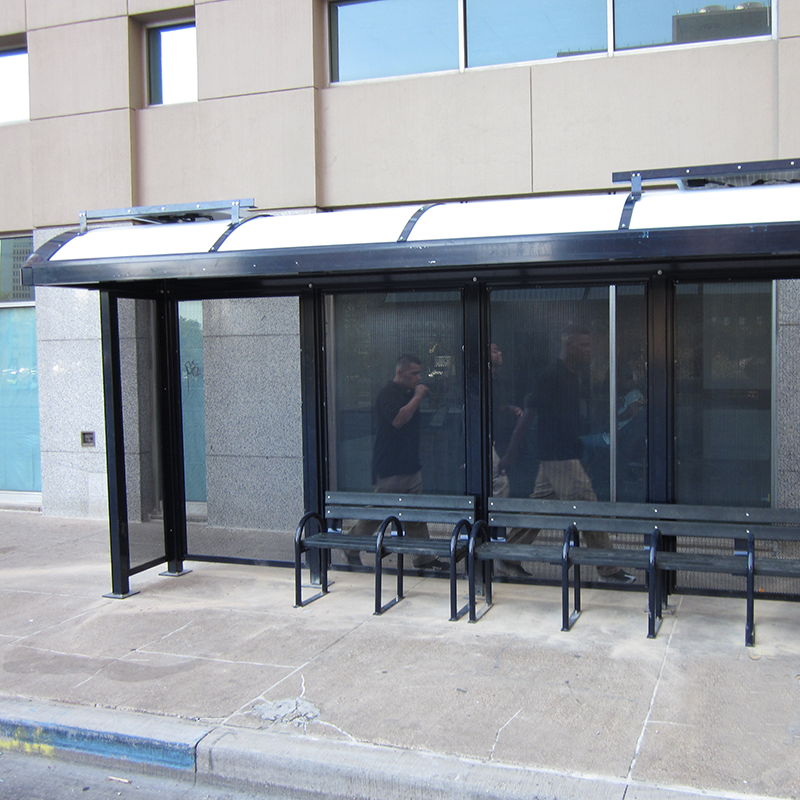 The system design includes 7 days of autonomy to allow for periods of inclement weather. 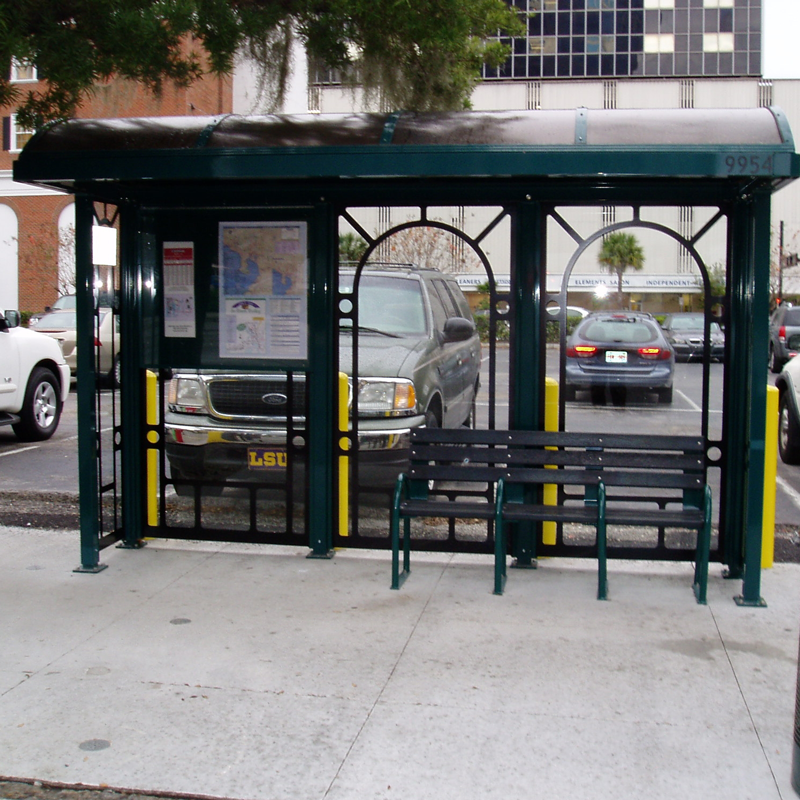 This enhanced approach to technology also allows for monitoring of the EMS remotely to monitor system performance. 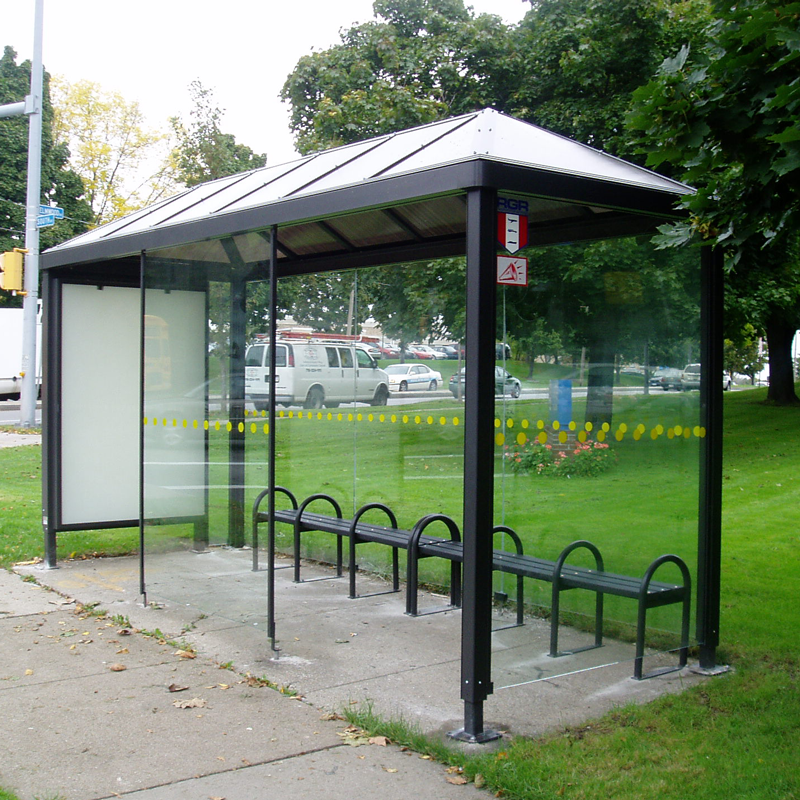 13′ Niagara style transit shelter with back-to-back backlit advertising display kiosk, 3/8″ glass walls, recycled slat bench with back-solar illumination. 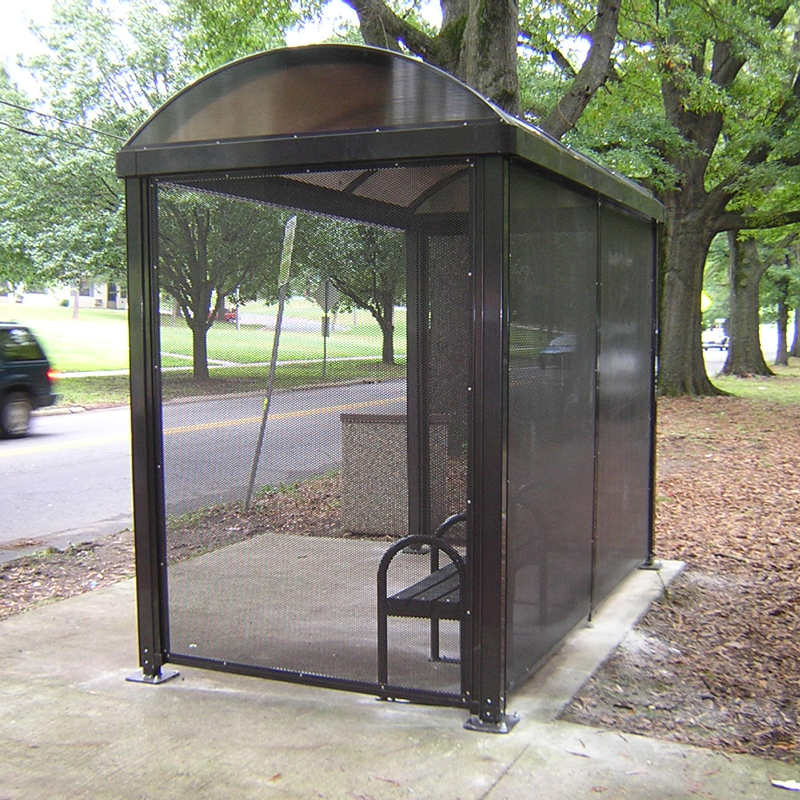 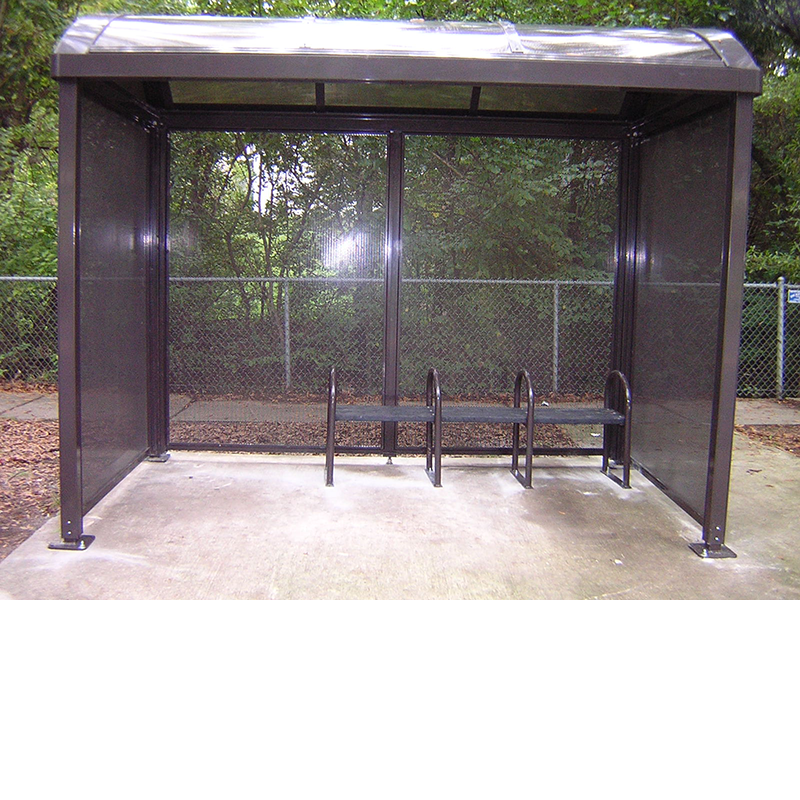 18′ Niagara mansard roof transit shelter with angled twin advertising kiosks and perforated metal rear walls. 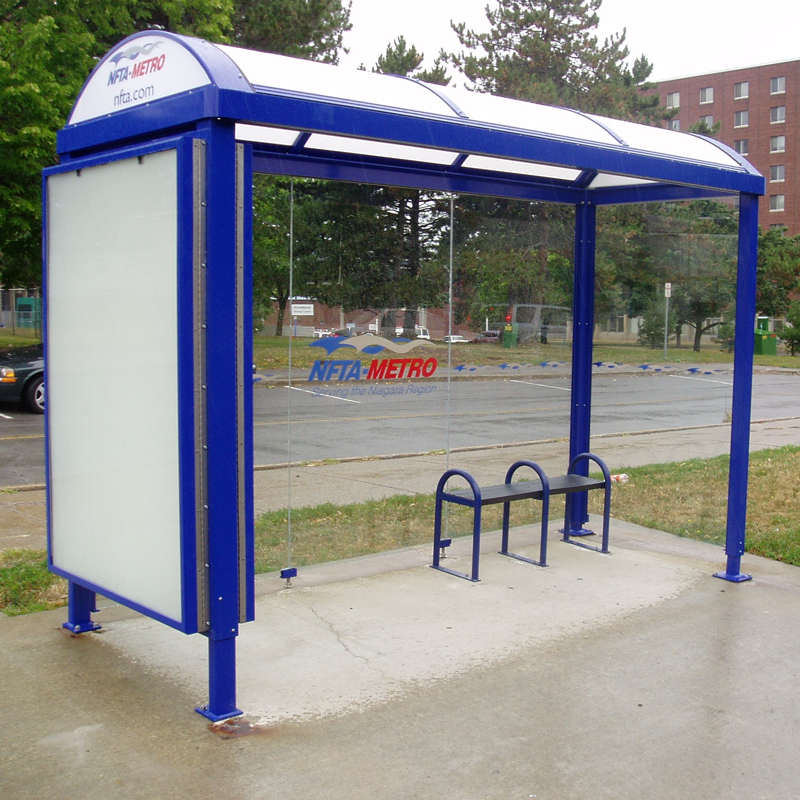 12′ Niagara dome roof transit shelter, backlit back to back advertising kiosk, white lexan roof panels, 3/8″ custom baked frit agency glass at the rear and end walls, recycle slat bench with anti-vagrant loops. 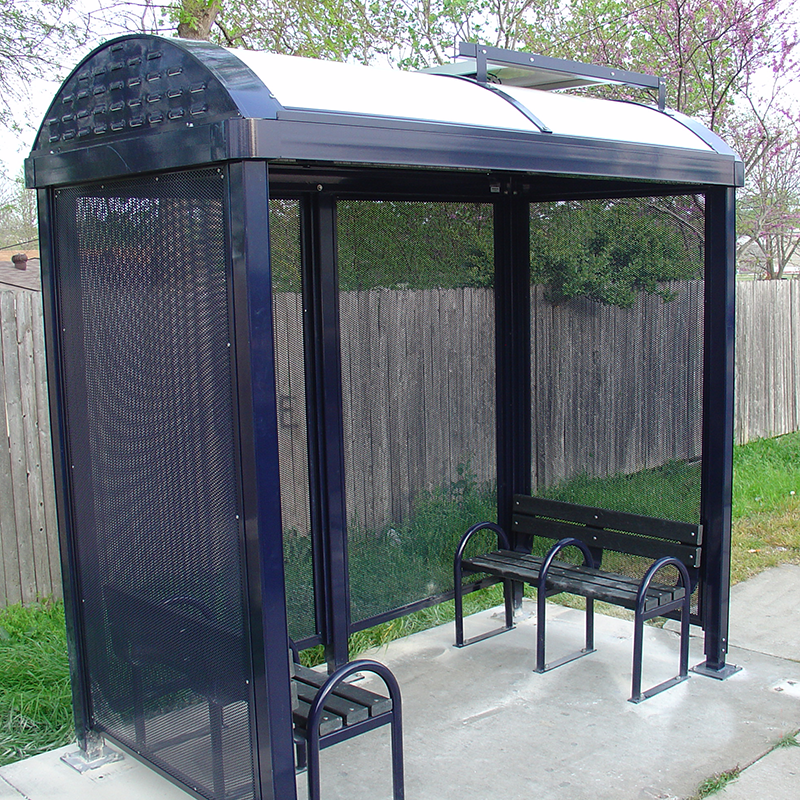 12′ Niagara hip roof transit shelter with backlit back-to-back advertising kiosk, Lexan roof panels, 3/8″ glass walls, recycle slat bench with anti-vagrant loops. 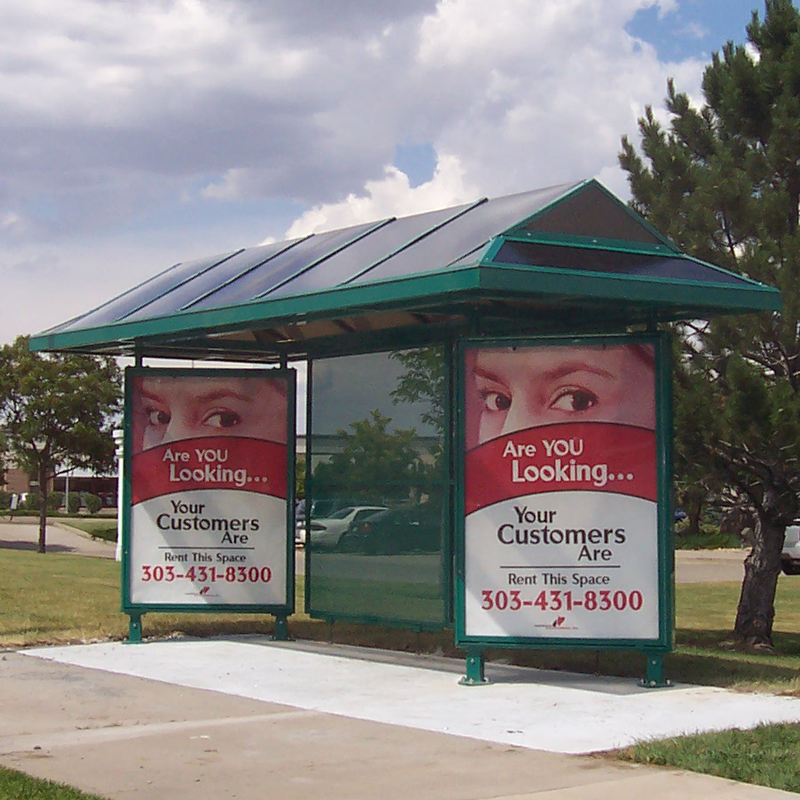 8′ Niagara mansard roof transit shelter with backlit back-to-back advertising kiosk, Lexan roof panels, perforated Victorian rear wall, wire grid bench with anti-vagrant bar.